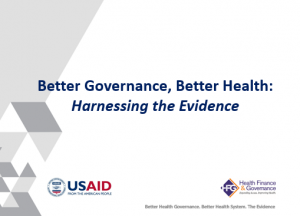 To address the gap in evidence on how health governance contributes to health system performance and ultimately health outcomes, USAID, the World Health Organization (WHO), and the HFG project launched the marshalling the evidence initiative. As countries work towards achieving universal health coverage (UHC), maintaining and improving quality of care remains a major priority. Payers are key actors in health governance structures and have powerful tools at their disposal to influence quality. Strengthening the roles and clarifying the responsibilities of the payer(s) and improving their collaboration with other quality stakeholders is critical to maximizing this role. 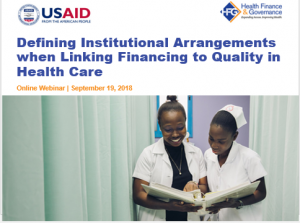 Join HFG Wednesday, September 19th at 9:00 am EST to discuss lessons learned on how and why countries should link health financing to quality and emerging best practices on steps countries are taking to improve institutional arrangements that strengthen these links. 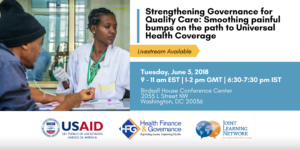 Join USAID’s Health Finance and Governance Project and the Joint Learning Network for Universal Health Coverage to discuss how the private health sector can be adequately regulated so that it sets standards for, protects and encourages quality in primary care. 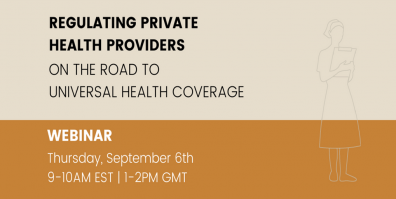 Listen as various countries discuss their experience and lessons learned in regulating the private health sector when providing primary health care. 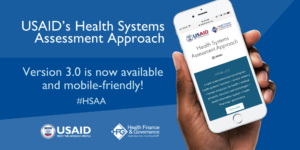 Join us Wednesday, August 22 as we feature USAID’s Health Systems Assessment Approach (HSAA) v3.0, a rapid assessment tool covering key health systems functions of service delivery, human resources for health, medical products, vaccines and technologies, health information system, health financing and governance. Hear from health systems experts on the latest updates and learn how you can use this powerful resource, now available through a web-based mobile application. 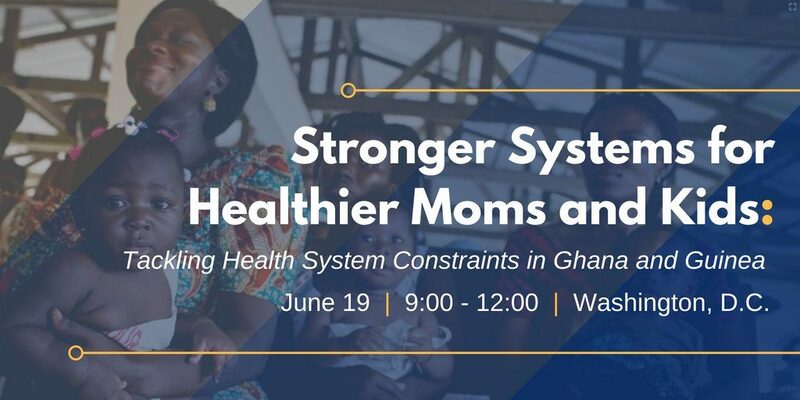 Please join us June 19th from 9:00AM to 12:00PM at the George Washington University’s City View Room as we welcome health system specialists from two USAID-supported countries, Ghana and Guinea, to learn how interventions at different levels of the health system are working to address common health system challenges in order to ensure equity, coverage, quality, and efficiency of reproductive, maternal, newborn, child and adolescent health services. 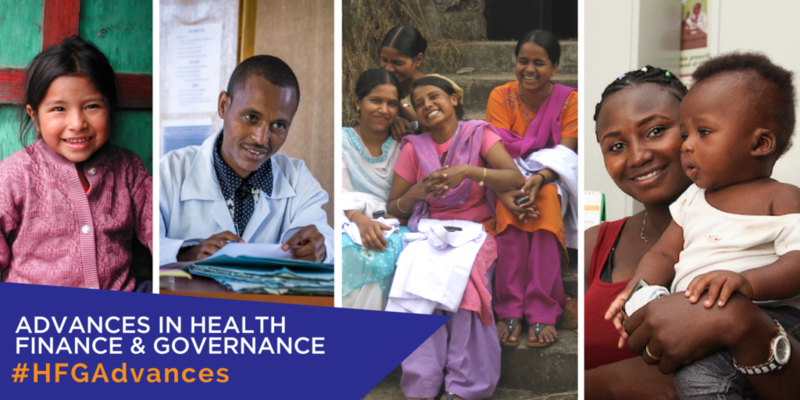 Join USAID’s Health Finance and Governance Project and the Joint Learning Network for Universal Health Coverage as we reflect upon country-level challenges, experiences and best practices in leveraging strategic communications to achieve UHC. 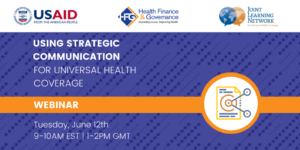 We will also be launching two resources – Strategic Communication for UHC: Practical Guide and accompanying Planning Tool – designed to help practitioners plan and implement effective communication strategies for UHC. Please join the USAID-supported Health Financing and Governance Project (HFG) led by Abt Associates along with the Applying Science to Strengthen and Improve Systems (ASSIST) project, the Joint Learning Network for Universal Health Coverage (JLN), and the World Health Organization for a special learning event in Washington, DC to showcase our findings from three years of collaborative work on governance and quality. Need to track how much a country spends on health but unsure which methodology best meets the country’s needs? Watch the second of three webinars on health resource tracking. Experts from across the globe will discuss similarities and differences of various resource tracking methodologies and the factors to consider when selecting a methodology. 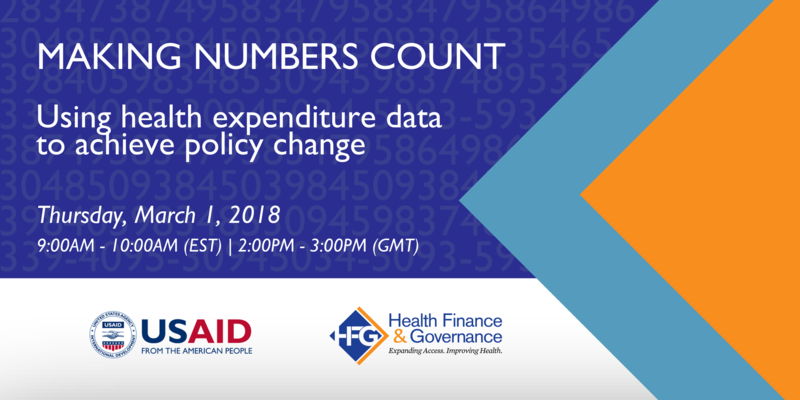 Please join us for our “Advances in Health Finance and Governance” End of Project as we reflect on the issues, share what we all have learned and discuss strategies for continued progress. in health system strengthening. A working health system delivers the quality health care people need, where they need it, at prices they can afford. 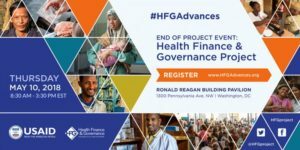 For six years, the USAID-funded Health Finance and Governance (HFG) project has been working to expand access to life-saving health care by advancing the health finance and governance systems in partner countries. 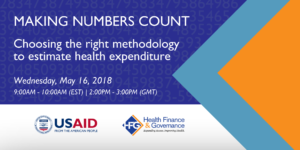 Join us for an upcoming series to leverage insights and collaborate on proven approaches for continued health system strengthening worldwide. 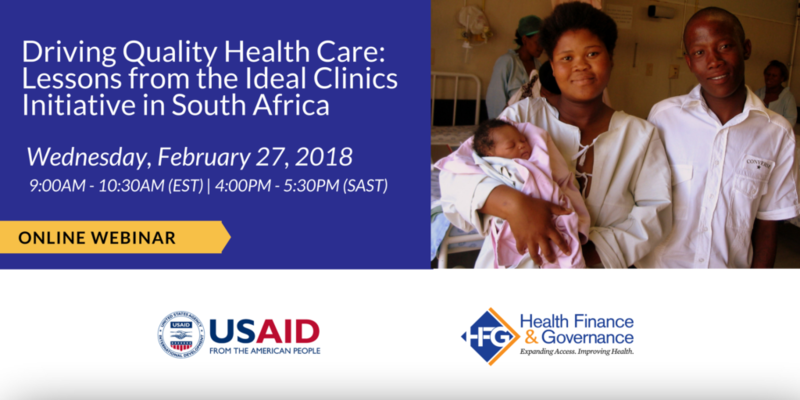 Watch to learn how the Ideal Clinic Programme, implemented by South Africa’s National Department of Health, is systematically improving the quality of care provided in primary health care facilities. Great! You have national health expenditure data. Now, how do you use it to better inform health policy decisions? Watch the first of three webinars on health resource tracking. Experts from Burkina Faso and Ghana join us to discuss practical approaches that have led to successful policy change. 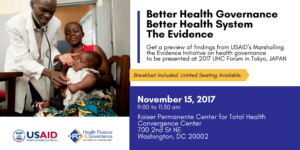 Get a preview of findings from USAID’s Marshalling the Evidence Initiative on health governance to be presented at 2017 UHC Forum in Tokyo, JAPAN Breakfast Included. 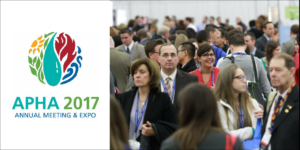 We will be presenting our latest work at the American Public Health Association 2017 Annual Meeting on Nov. 4-8, 2017 in Atlanta, Georgia. Learn more about our work during one of our many presentations! 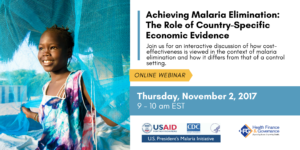 Join the Malaria Economic Research Community of Practice to discuss and collaborate on current and needed economic research to inform critical malaria decisions and drive progress. As gains in malaria control continue to be made, more malaria-endemic countries are pursuing elimination. 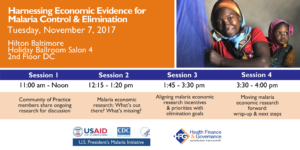 To achieve elimination, more evidence is needed to determine the combination of interventions that has the highest impact and is the most cost-effective given the prevalence. Watch our interactive discussion of how cost-effectiveness is viewed in the context of elimination and how it differs from that of a control setting.